I unexpectedly found myself in need of a Get Well card only to find I didn't have a single one in my stash! What a sad state of affairs. Apparently I need to go on a binge crafting session so I have some set aside for future need. I've got lots of birthday cards though! Anywho, I needed something I could throw together pretty quickly but I also wanted it to be a little bit elegant. This is for my husband's great grandmother and I always try to send her something a bit snazzier. I scrounged around in my stacks of sentiments and florals looking for just the right ones. I really, REALLY need to get my organization done. Maybe I'll have a time at Christmas to make a dent. Ok, back on track. Let me just go ahead and show you my finished card! I didn't really have a plan when I sat down but that isn't unusual for me. I heat embossed the main flower from Concord & 9th's You Are Enough stamp set in gold onto Bristol paper. I then used the Deep Red Zig Clean Color Real Brush marker and a water brush to spread out the color. After it was dry, I went back with one of the warmer gray Zig Clean Color markers and went all around the image. I used the water brush to spread the color all the way out to the edges. I used a circle die from MFT stamps to cut out the flower layer. I used a Spellbinders scalloped circle die to cut out the gold glitter layers. The patterned paper is from Basic Grey and was cut with one of my favorite dies from Craftin Desert Divas. 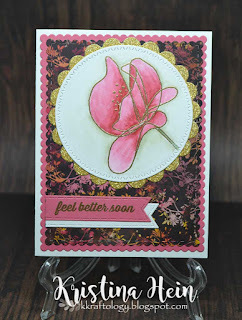 I then cut the pink layer from Stampin up Rose Romance cardstock using a scalloped die from Mama Elephant. 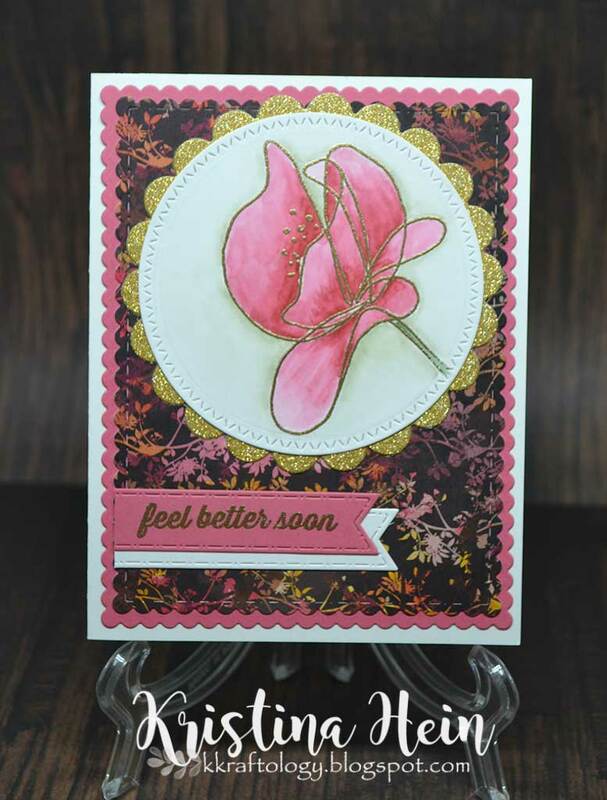 The sentiment comes from a MFT Stamps set and I embossed it in the same gold powder I used for the flower. I then cut it out with a banner die from Craftin Desert Divas. I cut a slightly longer banner with the same die from bristol paper. I adhered all the layers to a white card base. I do hope my husband's great grandmother likes it and brings her a little cheer!